I remember when I first started playing poker. I had read about tells — those actions and mannerisms that tend to give away the true strength of a poker player's hand. I recall focusing intensely on my opponents trying to pick up on some giveaway tell that would help reveal their secret hand. I spent a lot of time observing tics, twitches, glances, hand gestures, and tone of voice. It was all for naught. Such intense focus notwithstanding, I didn't really learn anything useful. The problem was, I couldn't answer a basic question — which actions meant nervousness caused by a strong hand, which actions meant nervousness caused by a weak hand, and which actions meant neither and were simply the result of a person's natural nervous twitch, tic, or nature? I have found over the years that rather than looking for some sure-fire giveaway tell, it is far better for most home game players (or low-stakes casino players, for that matter) to keep an eye out for a few obvious actions that might tend to indicate the strength of a hand. Here are 10 very simple and obvious behaviors that you will easily notice at the tables, along with some discussion about how you can use them to figure out how they might relate to the hand strength of the players demonstrating them. Among most players, a large raise, and surely a reraise, generally means a strong hand. Seems obvious, I know — and it is. But many players in low-stakes games tend to try to convince themselves that their opponent is bluffing. Sometimes they are, but most of the time aggressive action means they have what they are representing. So until your opponent gives you a reason to think otherwise, tend to respect his large bets and raises. 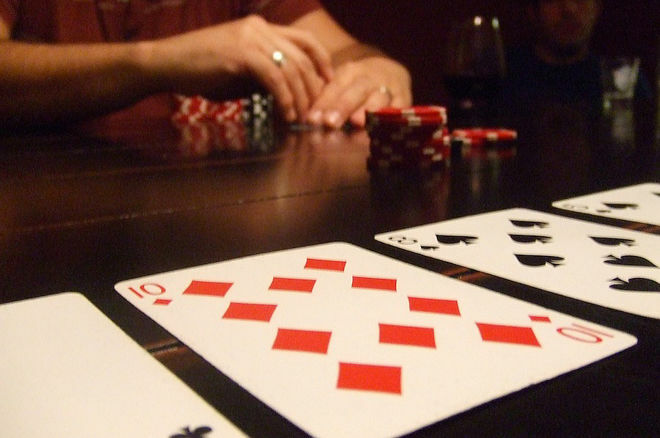 Yes, there are players who are good at talking up their hand to get you to fold. But most of the time if a player is talking about his hand or your hand, he is trying to get you to call. Respect his bet and save your money. When the flop, turn, or river hits, try to watch the reaction of your opponent (or the opponent with the largest stack if you have a few opponents). Does he keep staring at the board a few seconds after the street has been dealt? If he does, this tends to indicate that it hasn't hit him and that he's weak. Expect him to fold to a decent-sized bet. If you're watching a player who is looking at the board and after a card hits he quickly glances at his stack, that often indicates that he has hit his hand. Respect his bet, no matter what he does afterwards. If he then looks away, this generally should confirm that he has a strong hand and is feigning disinterest in it. This is a fairly dependable tell that a person wants to see if he has a flush or straight draw — meaning he's weak. Yes, some players have learned to fake it. But the rechecking of hole cards usually means that the player is trying to remember the suit of a card to see if he might have picked up a four-flush. If he hit the flush, he wouldn't be checking. Less commonly, rechecking might indicate that a player is looking to see if he hit a straight draw. Either way, you should expect him to be on a draw. This is a very reliable indication of weakness. Players who grab chips and hold them before it is their turn to bet generally are trying to intimidate you into not betting. I recommend betting into guys who grab their chips — and then watch them fold to your action. Of course, if they're really new to the game and have not learned anything about artifice, they may actually be doing this because they hit their hand. But that is extremely rare even in a home game. Players who are busy organizing their chips into neat stacks, eating at the table, or having a conversation with someone who is sweating them are rarely betting as a bluff. Betting is a distraction from what they're doing, and they're unlikely to do it without a good reason. If they bet, respect it. Players sometimes look at their hole cards and then pull them toward their chip stack. This usually means that they intend to play the hand because they're strong. If they were truly disinterested in them and planning to fold, they'd leave them where they lay, square them up with their finger behind them, or pick them up in preparation for tossing them in. Looking away after looking at hole cards or the board, especially if it is prefaced by glancing at the board, is generally an indication of strength. Expect these players to bet — and when they do, respect it. This tell is only useful a few times in a playing session, but it might save you your stack. When players are getting ready to leave for the night or for a meal break, it's often pretty obvious. They often say they're leaving, and they'll usually begin to put their chips into a rack, put on their jacket, or otherwise indicate in some physical way that they're getting ready to go. If they do that and then make a bet or raise, you can be nearly certain that they have a legitimate hand. If they bet or raise, save your money and fold. Some players have learned these tells, of course, and may reverse them on you. So always be on your guard. Also, it's always helpful to have some history with players to get an idea of how they typically act so as to be able to know how something that looks like a tell either fits into a pattern or diverges from it. Even so, I have found these tells to be mostly reliable — and very easy to spot. Against fairly simple and routine opponents, noticing these obvious tells, and acting accordingly, should help you win some extra money. Ashley Adams has been playing poker for 50 years and writing about it since 2000. He is the author of hundreds of articles and two books, Winning 7-Card Stud (Kensington 2003) and Winning No-Limit Hold'em (Lighthouse 2012). He is also the host of poker radio show House of Cards. See www.houseofcardsradio.com for broadcast times, stations, and podcasts. Photo: "Poker Night," TineyHo, CC BY-SA 2.0. Stay connected. Follow us on Twitter and like us on Facebook! Can You Still Win in Small Stakes Poker Games With a Tight Style of Play? Anyone have Recs for best seafood restaurant and best club to hit after game 5 in Portland on a Tuesday ?